At The Arbors at California Oaks, our mission is to make home synonymous with luxury. Our freshly renovated Murrieta apartments feature contemporary finishes, eye-catching kitchens, and spacious living areas, making your apartment truly feel like home. Plus, our Murrieta apartment complex features resort-style amenities and a central location to make living feel like luxury. We're proudly accepting new tenants – contact us today! Two resort-style pools, a state-of-the-art fitness center, a tennis court, a basketball court, and even our very own car wash area, all right on our property. No matter what your lifestyle is, our world-class amenities provide something for everybody! In real estate, they say location is everything – and The Arbors at California Oaks is hard to beat. Located in the heart of Murrieta, CA, we are surrounded by tranquil neighborhoods, beautiful parks, and easy access to nightlife. Plus, with our direct access to I-15, the Temecula wine country is never more than a short drive away! No matter what your lifestyle, you'll love living at The Arbors at California Oaks. 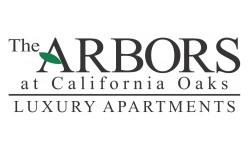 With renovated apartments, luxury amenities, and a location that can't be beaten, The Arbors at California Oaks is the best way to find your dream apartment. Call us at (951) 373-2712 with any questions, schedule a viewing of a one or two bedroom apartment, and apply online today to find your dream apartment. We can't wait to hear from you, and we look forward to helping you make The Arbors your new home!